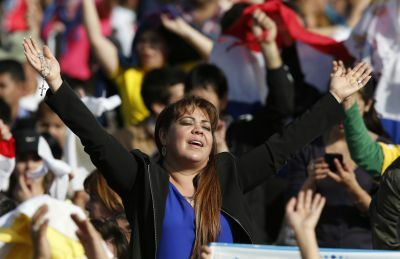 ASUNCION, Paraguay (CNS) — Christians cannot force anyone to believe, but at the same time, no one can force Christians to stop being welcoming, loving and living in solidarity with others, Pope Francis said. 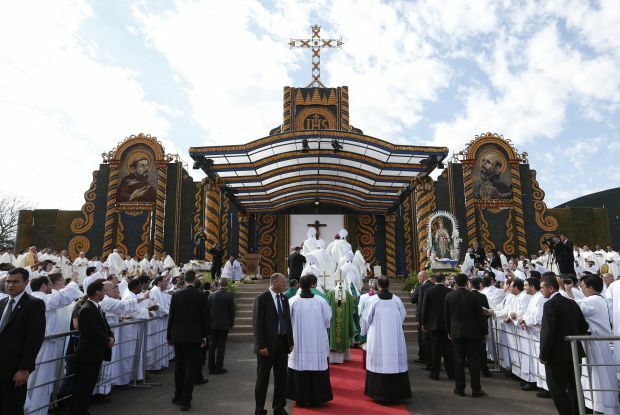 On the last day of his July 5-12 visit to South America, Pope Francis celebrated Mass with close to 1 million people at Asuncion’s Nu Guazu Park. Artist Koki Ruiz designed the altar and stage, which was made of coconuts, corn cobs, gourds and other plants and vegetables. The artist built the massive structure at his studio and brought it to the park in pieces. As he assembled it, he allowed members of the public to sign the coconuts and write their prayer intentions on them. The fruits of the earth and the expressions of local culture were obvious at the Mass with its prayers in Guarani, a native language, and with a variety of traditional hymns and percussion-punctuated songs. 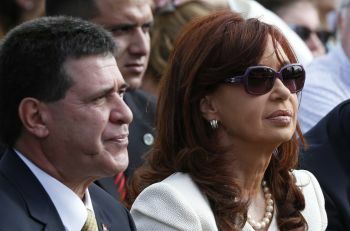 Tens of thousands of people from Argentina, including President Cristina Fernandez de Kirchner and Greek Orthodox Metropolitan Tarasios of Buenos Aires, also attended the Mass. “Our communion with God always brings forth fruit, always gives life,” Pope Francis said in his homily. A firm trust in God, he said, is learned within a family and within a community that has experienced the transforming power of God’s grace and knows it is called to share that grace with others. Mission, evangelization and sharing the faith are not programs, he said. They flow from a way of living in response to God’s blessings. “How many times do we see evangelization as involving any number of strategies, tactics, maneuvers, techniques, as if we could convert people on the basis of our own arguments?” he asked. The day’s Gospel reading from St. Mark, which tells of Jesus sending his disciples off two by two to cast out demons and heal the sick, makes it clear that “you do not convince people with arguments, strategies or tactics. You convince them by learning how to welcome them,” the pope said. “How much pain can be soothed, how much despair can be allayed in a place where we feel at home,” he said. Isolating oneself harms the individual and harms the community, Pope Francis said, which is why the church has the mission of teaching Catholics to live in harmony with each other.